Thanks for entering our contest and good luck! Have you made a project you're proud of? 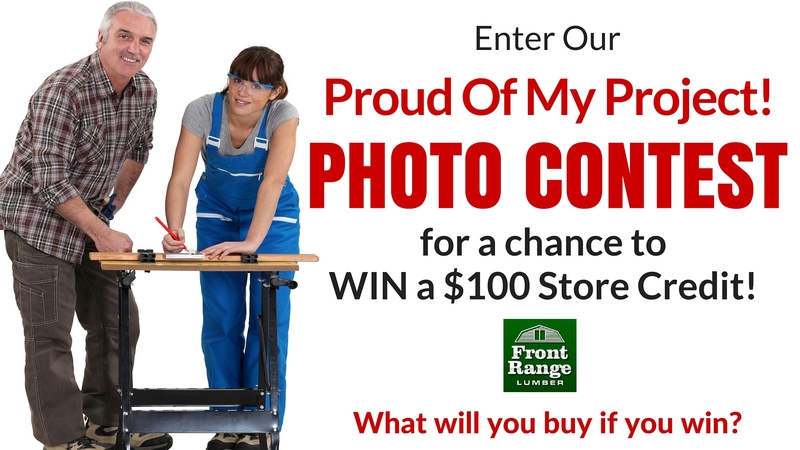 Enter Front Range Lumber's Proud Of My Project photo contest. 2. Submit by entering below. This submission period ends on April 30, 2019. 3. We will pick and announce the winner by May 6th! Won't have your project done on time? No worries, we'll be doing a new contest next month! Front Range Lumber will at its sole discretion pick each month's winner. Any submission may be rejected for any reason deemed by the Company. All submittals from the previous calendar month will be reviewed and one chosen. Winner will receive a $100 in-store credit towards their next single purchase. Credit will expire one year after the award date. Any/all pictures, names, and project descriptions submitted may be used on social media and/or Front Range Lumber's website. Submission shall release Front Range Lumber from any liability. The contest may end without notice.